In a new report, NCL took a close look at travel insurance associated with airline tickets and found a string of disturbing trends in the industry. Among the finds in the report are rising cancellations fees, the four U.S. legacy airlines just increased cancellation/change fees to $200 per ticket; an increase in revenue from travel insurance, in 2010 travel insurance was a $1.8 billion industry and between 2006-2010 travel insurance sales increased 39%; and the widespread use of misleading language and dense policy descriptions in airline insurance policies increasing consumer confusion over what these policies actually cover. We urge consumers to inform themselves about these policies before paying extra money for insurance. Be sure to read over the exclusions and fine print of any travel insurance policy before you buy. Some travel insurance policies include a cooling off period during which you can cancel and receive a refund on your premium. Check you certificate of insurance for details. 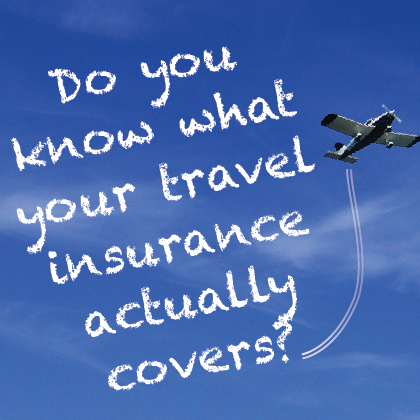 Before purchasing travel insurance, check to see if you’re already covered by other policies. For example, many credit card companies offer travel insurance protection to their cardholders. Check out an airline or online travel agencies’ cancellation fee policy before your buy. Some airlines charge low or no fees and instead bank the value of the ticket for a future flight. Find out more about these travel insurance policies and check out our Facebook page to find out what your insurance actually covers.